On a leisurely weekend drive through New South Wales’ Southern Highlands region, we stopped for lunch in Bowral, the town where Don Bradman grew up, and famous for the Bradman Oval and Bradman Museum. But in recent years, Bowral has become notable for a different, and culinarily oriented reason. 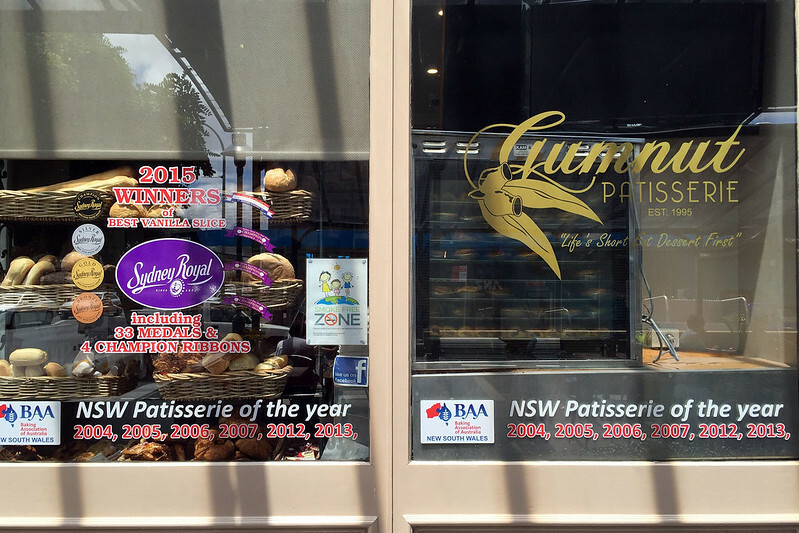 It is the home of the Gumnut Patisserie, established in 1995, and quick to win an impressive list of honours. 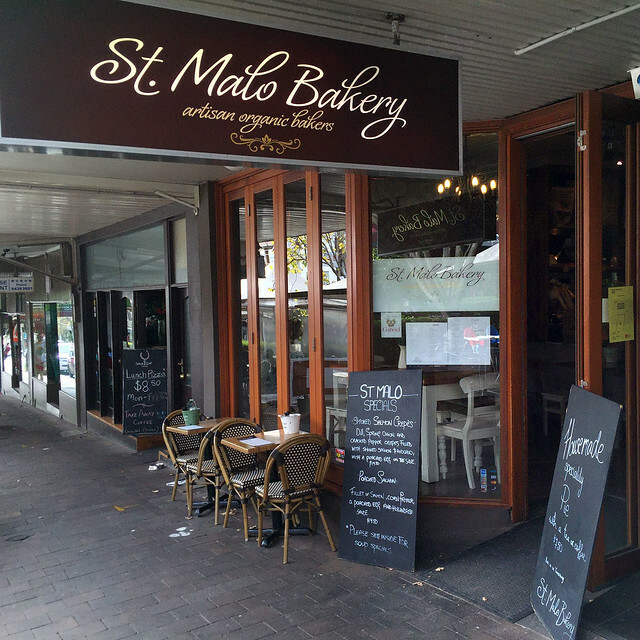 It won the Baking Association of Australia award for best patisserie in New South Wales in 2004, 2005, 2006, 2007, 2012, and 2013. And as the comma at the end of the list on their window shows, they seem determined to win it again in the future. 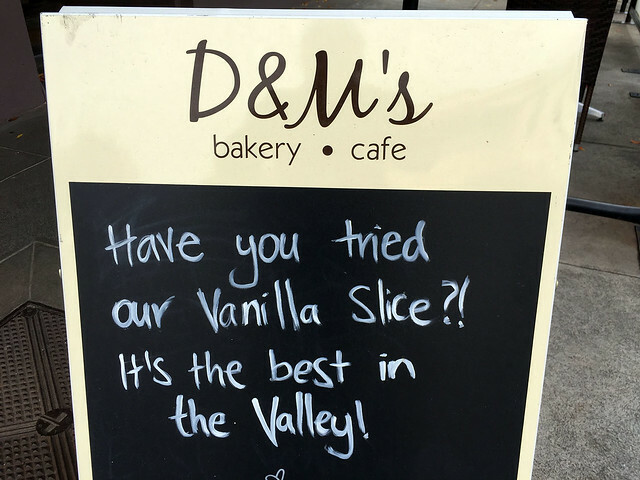 Not only this, but in 2015 they won the grand prize at the Sydney Royal Easter Agricultural Show for Best Vanilla Slice. Clearly this is a place we cannot ignore. On a fine winter Sunday afternoon, after a relatively light lunch, the call of afternoon tea beckoned, and I decided to make the trip and check out a place that garners a mention in various “best vanilla slice in Sydney” discussion threads on the Internet. 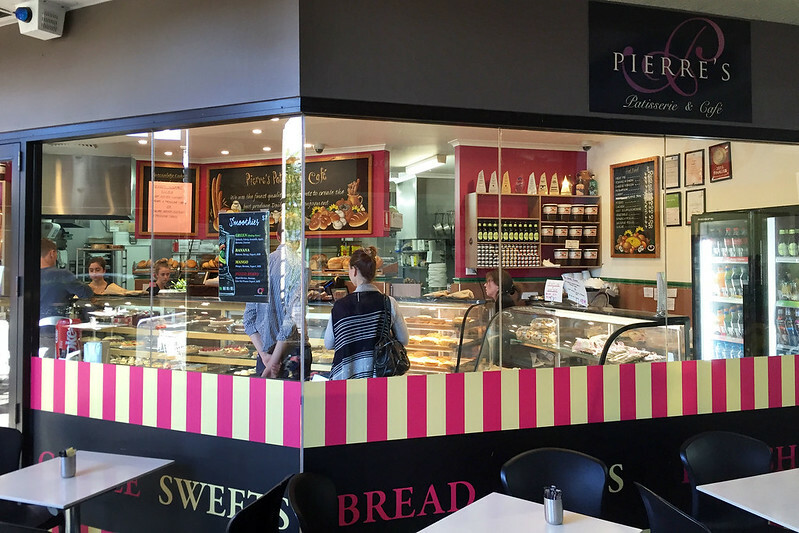 The place is Pierre’s Patisserie, on the Pacific Highway in Turramurra, in Sydney’s northern suburbs. According to the potted history on the website, Pierre’s was founded in 1976 by immigrant Frenchman Pierre Cantin. He was not, however a pastry chef, so hired two chefs, who preceded to build a reputation in the local area. The current owner and chef is the son of one of those two, and appears to have maintained the local praise for this establishment. 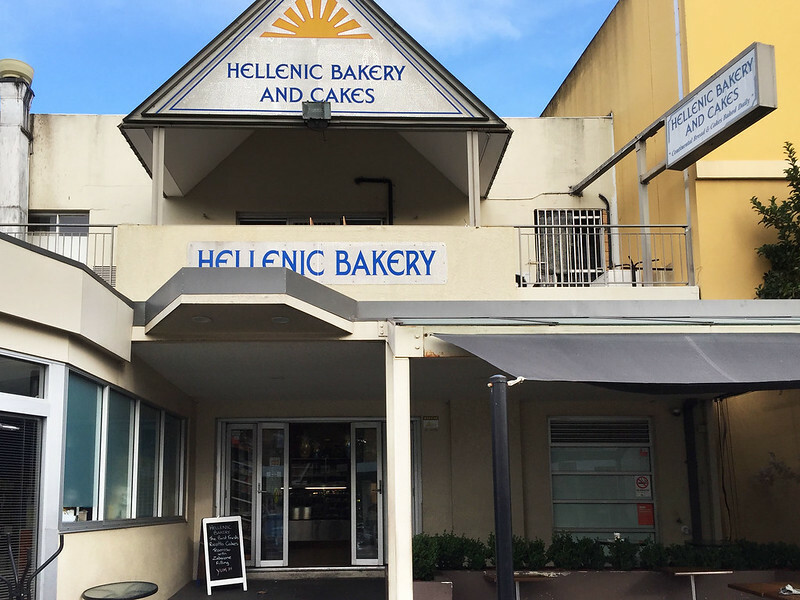 I was on my way home from a business function in an unfamiliar neighbourhood when I stumbled across Hellenic Bakery and Cakes, just a stone’s throw from Marrickville railway station. Peering into the unlikely looking 1990s semi-brutalist concrete exterior, I discovered an Aladdin’s cave of wondrous treasures. Mounds of Greek pastries and cakes filled display counters that rose above eye level on three sides of the dimly lit store: baklava, kataifi, poura, galaktobouriko, Greek shortbread. Amongst these are more diverse wares: cannoli, eclairs, macarons, lamingtons, tiramisu, tarts, and all manner of cakes. In the centre of the room was a table laden heavily with freshly baked bread and buns. Anything and everything looked incredibly tempting, but my eyes fell upon a golden radiance emanating from one corner of this treasure pile. A tray of humble vanilla slices beckoned, promising release of the genie of deliciousness if I would but rub some coins in my pocket and hand them over to the elderly Greek woman who was tending the counter.